JCECE Result 2017: Jharkhand combined Entrance Competitive examination board conducted JCECE 2017 for the aspirants who are seeking admission in various engineering courses in the state of Jharkhand. The JCECE 2017 exam will be conducted on 7th May 2017. The JCECE 2017 Result will be declared on 22nd May 2017 (tentative). Aspirants can also check the details about the JCECE 2017 Seat Allotment and JCECE 2017 cut off marks in the article given below. The aspirants who will clear the cut off marks will be called for the JCECE 2017 Counselling and the counselling will be conducted. The candidates who are waiting for the JCECE Result 2017 can check their results on the official website after the declaration of the result. After the declaration of the results aspirants will be able to access their score card and if they qualify the exam they will be called for the counselling process. There are some steps to download the JCECE 2017 Result are given below. Aspirants have to access the official website of JCECE. 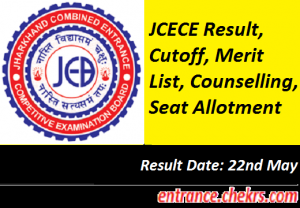 Now click on the JCECE results 2017 in the notification panel. Fill the desired information i.e. registration number, name, and date of birth. Download the result and also take a print out of the scorecard for the counselling process. Aspirants are required to register themselves for the counselling. Aspirants have to fill their institute preferences. A seat allotment letter will be given to the selected student. The Handwriting verification of Applicant will be done by the Counselling committee for the verification purpose. Final JCECE 2017 Seat Allotment will be done for the aspirant. The document Verification will be done during the admission process. If the aspirant will be absent on the day of counselling he/she will be debarred from the admission process and they cannot claim their seat in the admission process. In the second round of the counselling aspirants, who want to change their preference can sit and also the vacant seats will be filled by this process. During the JCECE counseling process aspirants are required to carry the following documents. Aspirants who will clear the cut-off will be called for the counselling process for JCECE 2017 Seat Allotment. The seats will be provided to the aspirants according to their scorecard of the written exam and the seat matrix will be settled by the exam community as per the scorecard. The counselling will complete in two rounds and the aspirants can join both the rounds. The candidates have to submit a registration form to join the counselling process. Aspirant can check their JCECE 2017 result and the seat allotment of JCECE 2017 after the declaration of the result. The JCECE B.Tech Results 2017 will be declared on 22nd May 2017 and after the results aspirants will be able to check the JCECE 2017 Cutoff to ensure that they have qualified or not. The seat will only allotted to the aspirants who will be present on the day of counselling. For feedback and more queries regarding the JCECE 2017 Results, you can contact us by commenting in the comment section given below.